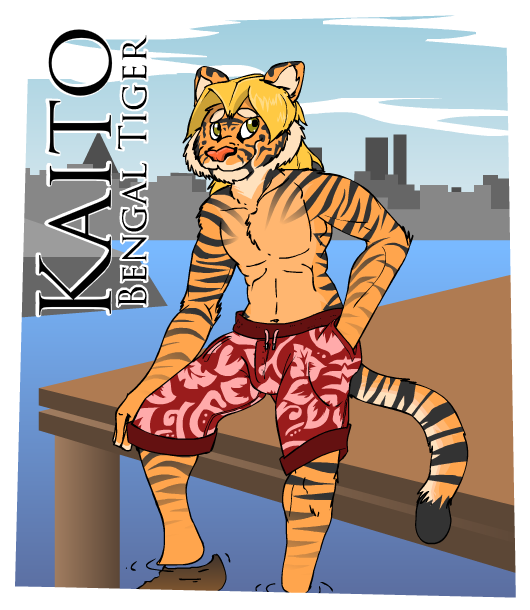 Kaito is a real cool cat. Not really bothered by the world turning around him, he's content just to while his days away at the shore or watching cheesy films. He'd certainly be a whole lot doughier if it weren't for his high metabolism and love of water activities. A little vain and a little lazy, he's none the less wise for his years (even if he never puts his talents to use). Given a few years and his parent's patience finally expiring, he'll surely be drifting from place to place, wherever the tide of the times will take him but for the mean-time at least, he's content in his bubble around the turbulence of modern Japan. Laid back and chilled, little phases Kaito. He's friendly, sure, but nothing quite beats some choice waves or the golden glow of the setting sun. If you do somehow manage to get him irritated however, you'll find the calm demeanor quickly gives way to the spite and fury his mother's family are so well known for. Likes chilling out with friends, ice-cream and warm summer days. Dislikes being rushed into things and being decisive. Kaito was brought up in Osaka by an American father and Japanese mother. He dropped out of school at 16 and hasn't really done anything since, having always just coasted by in life. His greatest achievement to date is lifeguard certificate that he'll never use. A gifted pilot at a young age, George quickly learned that good looks, a calm demeanor and all the beautiful Air Hostesses you could ask for can't fill the void of trans-pacific flights. He fell head-over-heels for Mayumi and within a month the two were engaged to be married. With little time for family matters, she quickly greeted the opportunity of a man who loved her for who she was (and not her position in the family company) and wouldn't mind long, painful periods of separation. For this reason, she allows George to maintain his membership in the mile-high club, provided he still comes home to maintain a family air. Kaito never really spent much time with his parents as they were so constantly busy, and occasionally manipulates this fact to get his way with them: this often flies (no pun intended) better with his father. Average build, fairly broad shoulders and about as much muscle tone as fat. Typically has a mullet with "curtains" parting in the front, auburn hair dyed blonde. Has some unusual colouration in that he has a pinker torso, with white restricted to his neck and crotch to under-tail. Stripes are dark and narrow, palms and soles are white. Generally hangs around in skinny jeans or swimming trunks, usually just wearing a vest and whatever pendant he thinks the girls will dig most. Gosh he's a very orangey tiger, even as far as tigers go. Had this character since about... what, 2006? Just never bothered drawing him. Well, here he is.